It’s good to be back in Missoula! 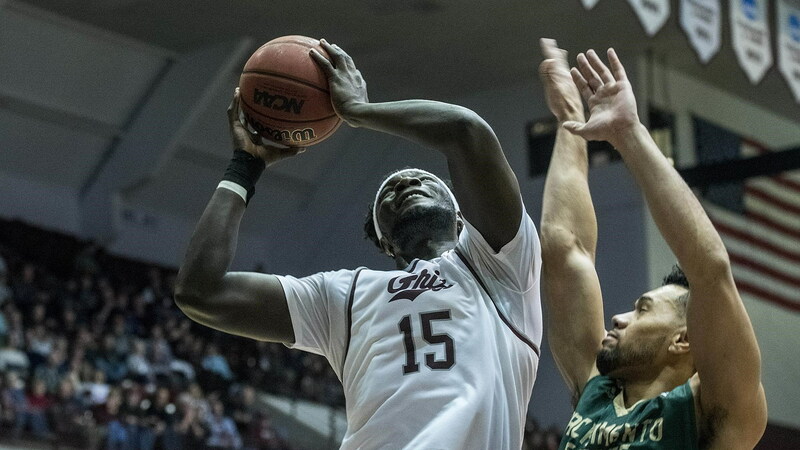 Playing its first home game in 17 days, and just its second in the past month, Montana returned to its home arena with authority, beating Sacramento State, 87-56, on Thursday night. Jamar Akoh reached 20 points for the third game in a row (21), but more impressive were his 18 rebounds, the most by a Grizzly in more than three seasons. While he dominated the paint on both ends, the Grizzlies also lit it up from deep, connecting on a season-high 13 three-pointers. Sacramento State entered the night as a top-40 three-point defense nationally, with opponents hitting at just a 29.7-percent rate on the season. Montana’s 13 makes were at a 65-percent clip. Overall, the Grizzlies’ 87 points were a season high by a Sacramento State opponent, 24 points above its season average. After a slow start that featured four turnovers and five missed shots over its first nine offensive possessions, Montana made up for lost time with seven consecutive makes to take an 18-14 lead. Then, with the score tied at 27-27 with under 7 minutes to play in the opening half, the Grizzlies burst the game open, scoring the next 13 points. During the run, Montana made five of six field-goal attempts – from five different players – while forcing the Hornets into three turnovers. Montana entered the locker room with a 10-point advantage and never looked back, using a 6-0 run to begin the second period. The Grizzlies led by at least 14 for the remainder of the contest, building their lead to 33 when Timmy Falls connected on a three-pointer with under 3 minutes to play. Falls was one of six Grizzlies to connect from deep, led by five makes from senior Ahmaad Rorie. The guard also scored 20-plus points for the third consecutive game (21), adding four assists and two steals. Sayeed Pridgett had 13 points on 6-of-9 shooting and three steals. Michael Oguine had 12 points and seven rebounds. In addition to his six points, Falls had a career-high seven assists. Montana pushed its winning streak to four consecutive games overall dating back to a Dec. 22 road win at South Dakota State. The Grizzlies have won 20 straight home games since the end of the 2016-17 season (fourth-longest active streak in the NCAA). Montana’s 87 points scored were the most Sacramento State has given up this season. The Hornets entered the night ranked 31st nationally, allowing 63.1 points per game. Playing his 100th career game, Akoh was dominant, totaling 21 points and 18 rebounds, in addition to two steals. It marked the most rebounds by a Grizzly since Martin Breunig had 21 vs. Carroll on Nov. 21, 2015. Montana shot 54.4 percent from the floor, marking the third game in a row and ninth time this season the Grizzlies have made at least half of their shot attempts. Montana’s .650 three-point shooting percentage, while its 13 three-point makes were its most in four seasons. Sacramento State entered the contest averaging 38.5 rebounds per game (top 20 percent in NCAA), but were out-rebounded 40-26. Montana has out-rebounded its opponents in four consecutive games, with Thursday being its largest rebounding margin of the year. Led by Falls’ seven, Montana had 19 assists on 31 made field goals. Rorie and Pridgett had four apiece. Montana’s 44 first-half points were also the most Sacramento State has given up this season, surpassing the previous high by (32) by a dozen. Sacramento State built a 6-0 lead through the game’s first 4 minutes but trailed for the final 27 minutes of game action. With the game already out of hand, Montana added another run for good measure, holding the Hornets without a field goal for more than 6 minutes late in the contest. Sacramento State’s leading scorer on the season, Marcus Graves, was held to 2-of-12 shooting, including 0-for-4 from deep. Montana is 3-0 to begin Big Sky play for the second year in a row, third time under DeCuire and 11th time in school history. Montana will host Portland State on Saturday evening. The Vikings are coming off of a loss to Montana State. Saturday marks Montana’s only home game until Jan. 24, so fans will want to be in attendance. All youth ages 12 and under get in free.